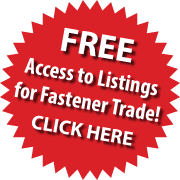 This website is for the Fastener Trade only. If you are a subscriber and you don't have the login info, please contact Joan at 847.537.1300. If you are not a subscriber, click the SUBSCRIBE NOW button below. By logging in, you acknowledge that access to the website listing is limited to subscribers and authorized fastener distributors and agree not to share information or login credentials with anyone outside your subscribed company. You understand that appropriated action, including suspension of website privileges, without refund, may be taken by BAI against any subscriber violating this confidentiality provision.